Sunblock & Sun Protection! - Broad spectrum coverage SPF Sunscreen: Be prepared for Fun in the Sun, Outdoor Adventures, Sports, Camping, and Fun in, on, or by the Water! Single use Packets & Towelettes, Our awesome Sun Care kit and more. OSHA Says: Use sunscreen. A sun protection factor (SPF) of at least 15 blocks 93 percent of UV rays. 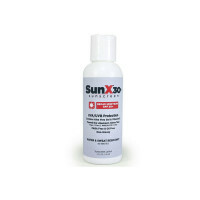 You want to block both UVA and UVB rays to guard against skin cancer. Be sure to follow application directions on the bottle. OSHA 29CFR 1910.132(a) requires employers to protect employees against overexposure to the sun's radiation. These product will help protect workers and aid employers to stay in compliance - convenient for in first aid kits, cabinets, and work vehicles. Whether you are the dedicated coach, the starting athlete, or the fan on the sidelines, you know that being involved with sports can mean being involved with injury. Sun burn IS an injury - a sun burn can be a first degree or even second degree burn - that's a serious injury and can lead to further illness. Remember that even the best sunscreen is useless if you don't put it on. Make sure to apply your sport sunscreen at least 30 minutes before going outside to play. And, apply it even on cloudy days. Our line of sports medicine products includes emphasis on the things you need to put injury behind you and get back in the game. Two great Sports First Aid Kits, and a selection of important Sports First Aid Supplies Below!